Structure Tone, a construction management company, surveys its clients each year to understand how goals and priorities in the green building industry are changing. 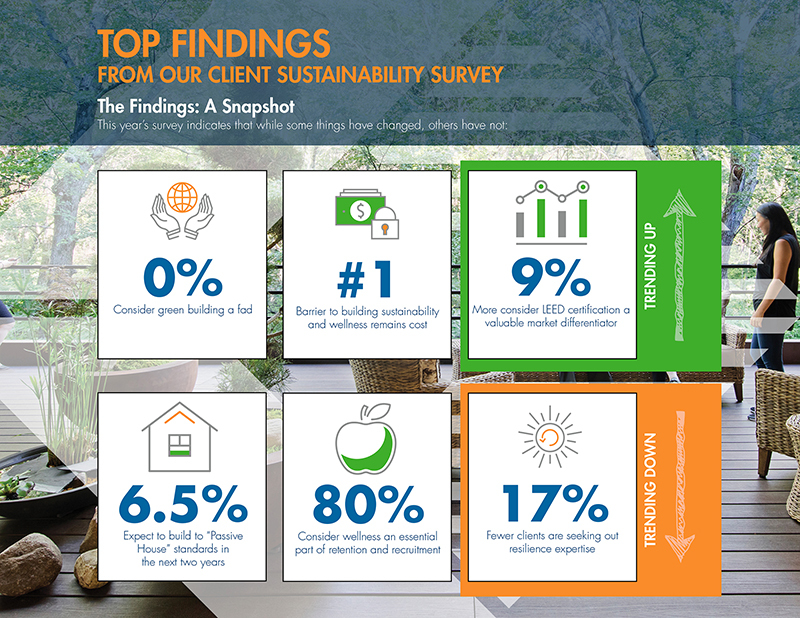 Findings from a recent survey of corporate real estate and facilities management professionals show that sustainable building practices are firmly established in the industry, with none considering it a fad. The survey, administered annually by Structure Tone, a construction management firm, aims to identify and track trends in sustainable building. Jennifer Taranto, director of sustainability at Structure Tone said the firm wanted to assess green building trends in the construction industry. “There weren’t any good metrics out there,” Taranto told BuildingGreen. She added that 37% of her company’s annual revenue is from projects that are registered for a third-party sustainability certification, but even internally there wasn’t the realization that such a large percentage of revenue came from sustainable projects. “So we owed it to ourselves to try to figure out what our clients were going to be asking for,” she said. Eighty percent of respondents agreed that employee wellness is an essential part of their companies’ retention and recruitment programs, and more than half of the respondents report plans to consult with external experts to incorporate wellness features into their buildings. A quarter of the respondents also report a goal of doing a WELL-certified project in the coming year. The findings also show that a growing number of companies see LEED certification as a preferred tool for pursuing sustainable building goals, with 62% of respondents—a 9% increase from the previous year—considering it a valuable market differentiator. The report also asked about barriers to green building goals. The number-one issue? Cost.